We made it, everyone. We made it through the bloodbath known as the 2018 ALDS. We trudged through this slow turn of an offseason. We stomached the endless cycles of speculation of Spring Training in the era of Twitter. And most importantly, this entry marks the completion of the 2019 Waiting For Next Year Cleveland Indians positional preview. It may have seemed like an eternity, but ultimately, the offseason was no match for Father Time and his ever-marching clock forward. And, in “celebration” of yesterday’s dominant Corey Kluber loss, I have for you, dear readers, the position in which the Cleveland Indians most impress, the absolute pinnacle of the squad. That’s right, the following is the Cleveland Indians rotation preview, nay, manifesto. Be warned in advance, this article may contain more than one healthy serving size of words. In some off-kilter scenario in which someone of knowledge was forced to narrow the state of the Cleveland Indians rotation down to a single word, they may feel compelled to choose the word “complete.” In the most literal sense of the word, they would be accurate. Of any positional group on the Indians, we, the public, have the fullest understanding of its composition. The rotation is finished; it’s complete. If all goes as planned, the rotation will be composed of Corey Kluber, Trevor Bauer, Carlos Carrasco, Mike Clevinger, and Shane Bieber, perhaps in that order or with Carrasco and Bauer swapped. Baseball, however, is not famous for its predictability. Should calamity strike, the next name in the depth chart is foggier. Should 2018 be indicative of 2019, Adam Plutko would be the sixth starter. But, in 2019, there are new names to consider. Injured List mainstays Danny Salazar and Cody Anderson exist now in some nebulous lesser state of injury and seem prepared to contribute this summer in some manner greater than moral support. Neither have the Indians been clear regarding the roles of acquisitions Chih-Wei Hu and Jefry Rodriguez, and while this author thinks that duo of twirlers may be more valuable out of the bullpen, this author does not own the Cleveland Indians, and they are therefore able to do as they please. Finally, it’s not inconceivable that long-time prospect Triston Mckenzie could debut for the Indians in 2019. Needless to say, while the particular identity of the next man in line is unclear, the Indians are not wanting for possible options, although none come close to matching the prowess of the currently slotted five. Other rotations can match the Tribe’s at its peak, but none can match it in terms of its depth from top to bottom. As a whole, the Indians’ rotation ranks first in total projected WAR. Like, way in first. In fact, the difference between the Indians and the distantly second-place Yankees, 2.5 WAR, is equal to the difference between New York and the seventh-place Dodgers. Impressively, despite collectively ranking first, the projected WARs listed above for each man are all less than their 2018 counterparts. If one is inclined to believe in the breakouts of Trevor Bauer, Mike Clevinger, and Shane Bieber, the actual WAR marks could be higher by a couple of wins. On the other hand, Corey Kluber’s decline is imaginable, and in that case, the rotation could perform worse than projected. It also goes without saying that pitchers are delicate, particularly in their ulnar collateral ligament region. Still, in 2018, the Cleveland Indians had the strongest rotation by fWAR in Major League Baseball; barring one or several catastrophes, the 2019 rotation appears strong enough to head down that same path. 2017 was a banner year for Corey Kluber, and his 2018 performance was worth nearly two wins fewer. For most pitchers, that would mark a sharp decline in value. For Kluber, a two-win deficit merely dropped him to eighth in the fWAR leaderboards amongst MLB starting pitchers, and a third-place finish in the Cy Young Award. These are also known as the career norms of Corey Kluber. One can be hopeful and hypothesize that 2017 an aberrationally good year, and that he remains the 5-6 win pitcher he had once been before. There are, unfortunately, some less hopeful ways to view his prognostication. For the first two-thirds of 2018, Corey Kluber’s fastball velocity sat at similar levels to the year before, but during the final two months of the season, the pitch slowed to career-low levels, causing some concern that his heavy workloads might have finally caught up to him. You’d never know from the box score: Kluber put up a 3.12 ERA/2.45 FIP, which may mitigate some concern. Still, a decline in fastball speed is a hallmark of broader decline; not many can find their stuff like Justin Verlander did. If Kluber’s fastball is sitting in the 92-93 range, around his career average, as the season progresses, it’s perhaps a sign that Kluber wearied down the stretch last season. Perhaps it behooves Terry Francona to be more cautious with his ace in 2019; after all, the state of the AL Central allows the Indians some wiggle room, and it’s in everybody’s best interest for Kluber to be rested and ready to go in October. Kluber didn’t just set a career-low in fastball velocity last year, but also in how often he threw that pitch. Until 2017, Corey Kluber routinely threw his fastball (sometimes classified as a sinker) over 50% of the time, but that season, he dropped it all the way down to 42.5%, and 2018 saw even fewer Kluber fastballs.1 This is a larger trend in baseball, but few pitchers could benefit from throwing fewer fastballs more than Kluber has and could continue to have. Fangraphs reports that over the last four years opposing hitters had a wRC+ at least 33% above league-average against the sinker. For comparison, against his unique breaking pitch, the highest wRC+ of opposing hitters over that same timeframe was 102% below-average. Opponents just can’t seem to figure out the Corey Kluber breaking ball. Logic and precedent both suggest that Kluber should throw his best pitch more often. During his soaring 2017, the Stetson University product threw his breaking pitch over 27% of the time, 38% more often than his previous career-high. In 2018, he split the difference, throwing the same pitch merely 22.7% of the time, instead favoring the cutter more often. I wish I could tell you more. I wish I knew why Corey Kluber decided to deprive us of more breaking balls. Maybe Kluber’s robot mind evolved the power of empathy when he saw this PitchingNinja tweet—his programmers should probably eliminate that function. Carlos Carrasco and I share an interesting trait. From 2009-2012, both of us possessed the raw tools for success, in Carrasco’s case, being a quality MLB pitcher, and in my case, being a functional adult human being in training. In 2012, I graduated from high school and was on my way to college to start the evolution of self-discovery that is one’s 20s (particularly one of privilege). In that same year, Carrasco graduated from his first UCL and found himself in the bullpen. Our lives are hauntingly parallel. The prize of the 2009 Cliff Lee trade to Philadelphia, Carrasco floundered in nearly every way a pitcher can; for opposing batters, his starts could have been described as “a holiday” or “extended batting practice.” Over that five year stretch, he struggled to miss bats, and to avoid walks, home runs, and the surgical needle, under which a damaged UCL ligament forced him to lie in 2012. The talent was present for Indians’ evaluators to see, especially after Carrasco emerged from his Tommy John surgery throwing his fastball 2 MPH faster than he had previously, but the results simply didn’t follow. In 2014, the Indians finally lost their patience. After four lousy April starts, Carlos Carrasco the starting pitcher seemed to have gone extinct. If careers resemble the life cycle of the lightbulb, the role change was Carrasco’s on/off switch. Out of the bullpen, where he threw exclusively out of the stretch, his stuff ticked up and the positive results the Indians had long yenned for finally materialized. By the end of the season, he had moved back into the rotation while maintaining his stretch exclusivity. Since then, the once-erratic Carrasco has become the hallmark of consistency. The man they call Cookie has averaged 4.5 fWAR per year since 2015, and his only serious injury sprouted from a comebacker off his throwing hand. His ERA hasn’t dipped below 3.29 or climbed above 3.63. The command issues that plagued him earlier in his career haven’t rearisen. That he hasn’t reached the peak of his rotation mate may have artificially dampened his public appreciation, but by fWAR, Carlos Carrasco would have been the best pitcher on 23 of the 30 teams in 2018. And, after signing a contract extension through at least 2022, Carrasco remains employed at a discount rate. Carrasco implements a five-pitch mix: a four-seamer, sinker, curveball, slider, and change-up, with the final two offerings often considered his go-to out pitches. Like Kluber, he’s thrown his fastballs less and less frequently as his career has progressed, and now opposing hitters can’t ever simply count on that pitch. He has always been most effective against same-handed opponents, against whom he employs nearly exclusively a two-pitch, fastball/slider combo. Lefties see a more evenly mixed distribution, although the change-up is utilized as the go-to secondary pitch. Platoon splits are present, but relatively minor compared to a more peculiar trend. For whatever reason, Carlos Carrasco has always fared far better on the road than at home, which isn’t a detriment to the Indians’ regular-season success so much as it to hometown Carrasco fans. Luckily, the front office is privy to this fact, too: Carrasco has two career postseason starts, both were on the road, and he allowed two runs in 11 innings. Lest this section of the article read like a sad oral history, I must limit myself to recounting just Trevor Bauer’s on-field history and future. There’s a wealth of content, both national and on this very website, regarding Bauer’s virtual antics, and I recommend giving those a perusal in order to understand the entire unnecessary plight he creates for the organization. Still, there’s a reason the Indians are willing to put up with the controversy. Bauer’s baseball season went about as smoothly as his Twitter season did rockily, which is to say, it went darn well. Aside from trivial W-L records, all of the “stats of note” represent career-bests for Bauer, and mostly by a wide margin. He attacked hitters on the first pitch at the highest frequency of his career (and far-improved from the year prior), while at the same time he fooled opponents into chasing balls about as well as he ever has. Shucks, just look at his zone profile with two strikes—he almost never threw the ball in the zone, and it worked. Trevor Bauer’s career is a unique one to analyze, partly because it’s just all over the map, but also because he is constantly reinventing himself. The famous tinkerer threw six distinct pitches in 2018: in descending order of frequency, Bauer delivered four-seamers, curveballs, sliders, cutters, change-ups, and sinkers. Before this mix, though, he threw a different slider and also a splitter. Who knows if those old pitches will ever be revitalized, or what’s coming after 2019! This past #nooffseason (as he puts it), Bauer developed a plus change-up (again, his words) to add to the mix; how he intends to implement the new pitch is unclear, given his lack of weakness in 2018 without it. Perhaps an underrated aspect of Bauer’s success could be attributed to that transiency—most pitchers functionally maintain their identity from year to year, but Bauer’s constant turnover forces hitters to adapt to him and makes old footage and data obsolete. Someone who faced him in 2016 essentially faced a different pitcher, and I wonder how difficult pitcher evolution is for opponents to track. One of the things that makes John Sterling’s “You Can’t Predict Baseball, Suzyn” funny to me is that I think in (how should I put this nicely?) some more traditional, sage-like circles (nailed it! ), the whole unpredictability thing tends to be overstated. We can and do predict baseball regularly, and sometimes those predictions bear semblance to reality. Still, in groups with more analytical leanings, sometimes I think we may be too confident. 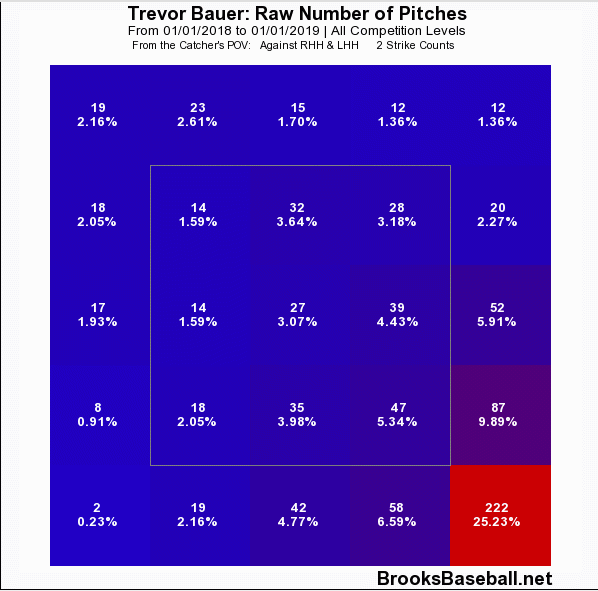 Trevor Bauer’s effectiveness as an MLB pitcher has varied wildly. Sure he excelled in 2018, and predictions do tend to favor recency, but it’s very easy as Cleveland fans and regular viewers to completely forget about pre-2018 Trevor Bauer and assume he’s a fundamentally different pitcher. This is not the right thing to do if one wants to be realistic. Bauer managed contact last season far more effectively than he had in years prior, and that skill may or may not stick around. Should 2018’s 6.1% HR/FB regress toward his career average, we probably won’t see a repeat of that 2.21 ERA or 2.45 FIP. The good news for Cleveland is that Trevor Bauer was so dominant in 2018 that a small step backward would still make for an extremely effective pitcher. In terms of where he ranks amongst members of the Cleveland Indians starting rotation, Mike Clevinger is a fourth starter. However, in terms of productivity, Clevinger resembles something far greater than that. After his fastball velocity fell nearly 2 MPH in 2017, the long-haired twirler was more able to rear back and fire as he had in 2016. Additionally, Clev has made a habit of ramping up his velocity as the season progresses, a trend that he’s exhibited in every season since his debut. So, if he comes out throwing a little more slowly than you remember, do not be alarmed, good reader, he always does this. Mike Clevinger also picked up a little habit you may recall from every other Indians pitcher, namely throwing fewer fastballs (although he does still throw his four-seamer over 50% of the time, the most of any of the pitchers discussed so far). Fangraphs has this feature called pitch value that assigns scores to each pitch in a hurler’s repertoire. For the most part, I don’t particularly care for these stats because their creation is so difficult to qualitatively explain; nonetheless, sometimes they provide a hint that perhaps a pitcher changed his approach. Indeed, Mike Clevinger’s fastball score in 2018 was above-average for the first time in his career, and it’s largely due to a new two-strike approach with the pitch. Exhibit A: Clevinger’s fastballs with two strikes from 2017 vs. 2018. It’s easy to see that Mike Clevinger focused on attacking the letters with his fastball in two-strike counts. You’ll have to take my word that by comparison, his fastball when behind in the count remained in a steady location over the same time period, and that all of the change to his fastball was with two strikes. It was still the pitch opponents hit with the most success, but to a far lesser extent than in years prior. Hopefully, as he continues to develop his command of his secondary stuff, he’ll be able to rely on the fastball even less frequently. More broadly, Clevinger just seemed to attack hitters more in 2018. He put up career-highs in both the percentage of pitches in the zone and first-pitch strikes, which forced opponents into swinging at a greater rate than years prior. More swinging led to shorter at-bats, and therefore fewer walks and fewer strikeouts. Certainly, no one in the Indians organization wants to see his K% continue to drop, but his stuff is good enough that he still whiffed opponents at an above-average clip, and his increased aggressiveness has done more to limit walks than it has to dampen the strikeout numbers. Most importantly, Clevinger’s emphasis on getting ahead of hitters was specifically crucial for him. In 2018, the average pitcher allowed a wOBA 202 points higher when behind in the count than ahead. 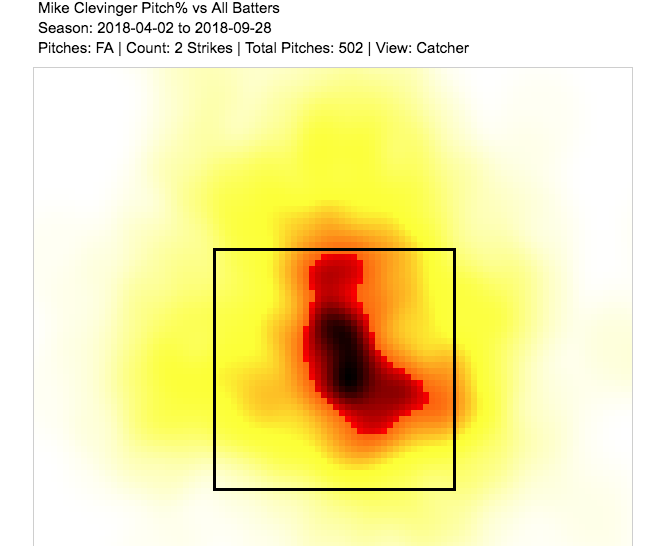 Clevinger’s split was even more pronounced, at 252, which I believe can be attributed to his tendency to rely far more on his fastball than ideal when behind in the count. As mentioned before, in total, Clevinger threw his fastball a little over 50% of the time; but, when behind in the count, that number shot up to 66%. 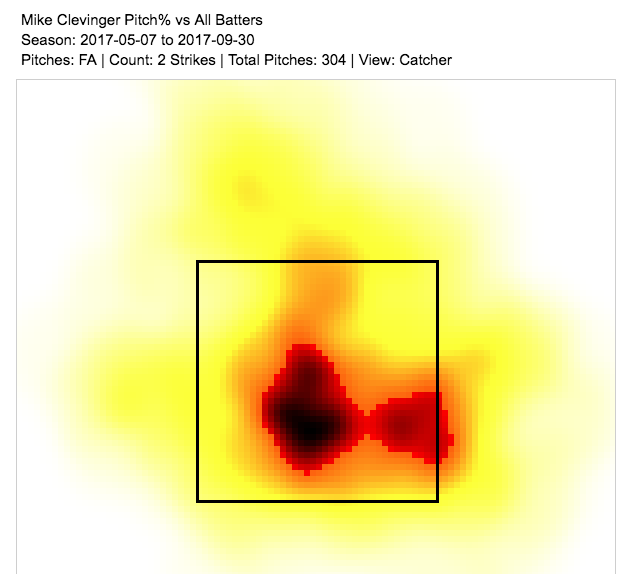 Rather than working on his confidence in his other pitches, Mike Clevinger decided to attempt to avoid the problem altogether by simply getting ahead of batters and avoiding dangerous situations, which is a pretty good strategy. Still, as Kluber and Carrasco age and Bauer leaves for free agency, it’s important to the Indians that Mike Clevinger continues to improve and takes the next step in becoming an ace, which I believe to be further development of and confidence in his secondary pitches. Shane Bieber’s prospect hype seemingly materialized out of thin air in 2018. Drafted in the fourth round out of UC Santa Barbara in 2016, Bieber impressed all of my fellow armchair scouts, myself included, with his immaculate control and anemic minor league walk numbers: in his 277 career minor league innings, Bieber unintentionally walked just 19 batters, or for those doing the math at home, that’s one walk every fifteen innings. Most fanbases would be ecstatic to learn of this unique talent; Cleveland fans, though, are haunted by Ghosts of Tomlins Past. The concern that Bieber is Josh Tomlin 2.0 is only somewhat justified. When the Indians drafted Shane Bieber, reports claimed that his fastball mostly sat between 88-90 MPH in college, and his pinpoint command was absolutely necessary for his success. This is of course literally identical to what we have known about Josh Tomlin for years. Luckily for both Bieber and those of us who choose to watch him, apparently he wasn’t done developing physically when the Indians brought him in. By the time of his midseason promotion, Bieber’s ugly duckling fastball velocity had turned into a beautiful swan, and rose to 93.4 MPH on average, which is relievingly and significantly faster than Josh Tomlin. And while his fastball velocity grew, his control remained Tomlin-esque. Amongst pitchers who threw at least 110 innings, Shane Bieber ranked 12th in BB%, and of those who bested him, only his teammate Corey Kluber, Justin Verlander, and fellow breakout Ross Stripling struck out a greater percentage of batters. That, my friends, is the good news. Unlike Tomlin, Shane Bieber’s stuff is above-average, which in 2018 led to a gaudy K%-BB%. Like Tomlin, batters seem to make the most of their contact off of Shane Bieber. In the pre-Statcast era, writers like me may have simply looked at the wide gap between his ERA and FIP (fielding-independent pitching), then the .356 BAbip that he allowed, and chalked up the 4.55 ERA to bad luck. Now, with Statcast, we can measure the fashion in which opposing batters struck the ball in order to evaluate performance versus results. It turns out the fashion in which opposing batters struck the ball against Bieber was solid. The average exit velocity Bieber surrendered, 89.4 MPH, was in the bottom 9% of the Major Leagues. I’m sorry to report that this is the bad news. Still, there is hope for Not Justin. Bieber knows that much of the damage done against him last season was at the hands of left-handed opponents, who roughed him up to the tune of a .383 wOBA, over 100 points higher than what righties were able to manage. Ryan Lewis of the Akron Beacon Journal has reported that Bieber has been toiling away this past offseason in an effort to revamp his change-up as a weapon against opposite-handed hitters. Bieber told Lewis that “last year, nothing was going away from [lefties], so…[the change-up is] something to change speeds on them and give them a different look and being able to throw it in any count is going to be big for me.” Last season, Shane Bieber used his curveball against lefties in the way most starters would use their change-ups. The lefties that were raised in polite homes thanked Bieber for this as they rounded second. If the young hurler’s claimed confidence in his change-up is genuine, his platoon splits will likely shrink in 2019, which could lead to a huge step forward for young Shane Bieber. As it was in 2016, and again in 2017, the Cleveland starting rotation has a chance to be historically great. Even as I’ve laid out possible red flags (or constructive criticism) for each of the members of the rotation, it remains the one with the highest floor and ceiling; it’s brimming with talent in a way that no other team can boast. The biggest question surrounding the rotation isn’t a matter of its quality, but rather whether the rest of the team will drag it down. Nonetheless, for pitching geeks both hometown and national, the Cleveland Indians starting rotation will be a treat to watch in April through September, and perhaps beyond.